Housed in a gilt, early XIXth century, Ochsenaugen frame. Tyrolean born Leonhard Posch was a pupil of the court sculptor, Johann Baptist Hagenauer. He befriended Mozart. All three were living in Salzburg and under the employ of the city’s Archbishop, Hieronymus Colloredo. The prelate, a famously odious taskmaster, made their lives unbearable. Mozart’s dislike for his employer extended to the city itself. In a letter, he confessed: “I hate Salzburg. It is not for me.” In another: “You have to admit it: In Salzburg, there is not a penny’s worth of stimulation. It is as if the audience consisted of nothing but tables and chairs. Salzburg is no place for my talent. There is nothing going on there musically. I do not wish to have anything further to do with Salzburg.” On the bright side, even unpleasantness can have its benefits. The hateful working conditions helped to consolidate friendships of long duration that Mozart maintained from his initial acquaintance until his death. With time, the three men escaped their situation by moving to Vienna. Mozart, arrived in the city somewhat later than Hagenauer and his apprentice, Posch. The composer, profiting by the free-lance opportunities provided by theaters, concert halls, talented performers, sophisticated audiences, and lucrative private lessons to the nobility, enjoyed a new-found freedom. At the very top of the social ladder, the emperor could – and sometimes even did – commission operas. While Mozart’s income was not steady, he was able to earn his living and support his family. Due to a serious illness, Posch was obliged to give up stone carving for less strenuous work. In so doing, he discovered his true vocation, the modeling of small portrait medallions in wax. He would become a fashionable portraitist of the Austrian bourgeoisie, and later, after moving to Berlin, of German society. Posch is best remembered today for his fine portrait of Goethe, and above all, for his two wax reliefs of Mozart. Constanze Mozart, the composer’s wife, considered the latter of these (the one to which the present plaster relief corresponds) and the late painting by Lange as the two best likenesses of her late husband. Up until the last war, the original belonged to the Mozarteum in Salzburg, but it is now missing. Posch used to sell replicas of his Mozart portrait in wax as well as in plaster, and the Mozarteum recently acquired a lifetime example with a bright blue background. Mozart’s profle in the present example is ivory-colored, and the artful trompe-l’oeil background resembles serpentine. Posch’s oeuvre consists almost entirely of portrait medallions, in which a typically neo-classical stress on outlines is happily blended with rococo liveliness of modeling. He depicts the composer bust-length in right profle, wearing a queue wig, a jacket, a neckerchief and frill. 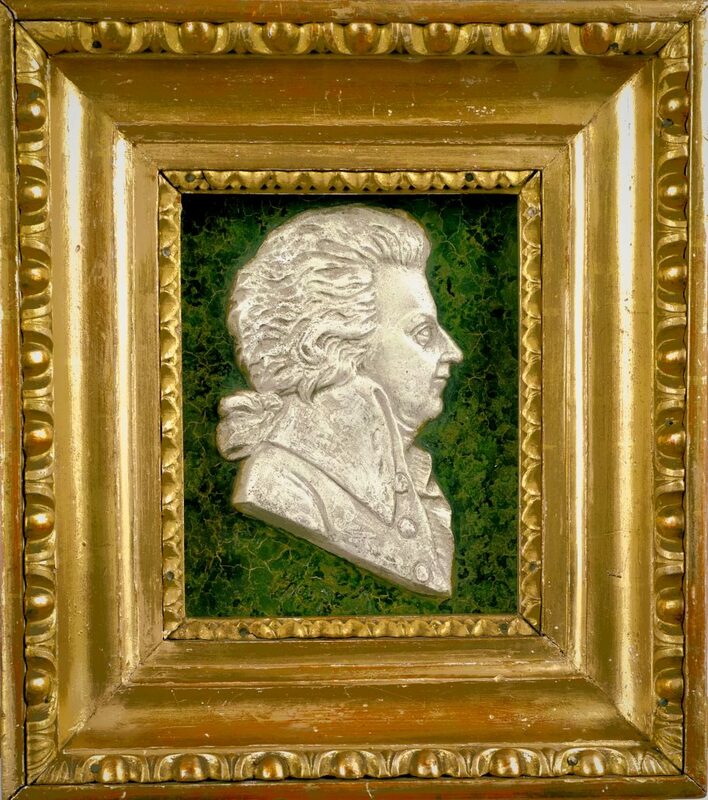 In the biography of Mozart imagery, Posch’s portraits date to 1788 (a red wax-relief) and to 1789 (a plaster relief, on which our example is based.) The authenticity of the images, among only a handful of confirmed period representations, makes them documents of extraordinary importance.